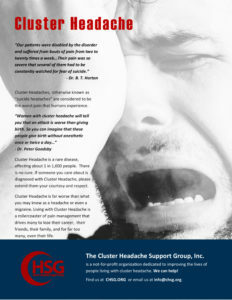 Cluster headache (CH) is associated with the most severe pain of the primary headache disorders. Barriers to optimal care include misdiagnosis, diagnostic delay, undertreatment, and mismanagement. Medication-over-use headache (MOH) may further complicate CH and may present as increased CH frequency or development of a background headache, which may be featureless or have some migrainous quality. SUNCT and SUNA are not rare conditions. Characterisation into episodic and chronic disease course appears to be of prognostic and therapeutic importance. Lamotrigine is effective in the majority of cases and subcutaneous lignocaine is useful as acute treatment for severe recalcitrant attacks.